The first baby-step we’ll take towards real programming is the Hyper-Text Markup Language, better known to us all as HTML. HTML is not a true programming language, it is instead a simpler beast known as a markup language – it adds context to text. HTML allows us to mark certain parts of a document as headings, other parts as paragraphs, and yet other parts as being emphasised etc.. Like with programming, we are conveying meaning to the computer, but the range of possible things we can ‘say’ is much smaller and simpler. Modern best practices for web development are the result of decades of evolution. We’re going to ignore all the techniques that time and experience have shown to be mistake, and jump straight to the end of the story – modern best practice. There have also been many versions of HTML over the years, and again, we’re going to jump straight to the end of the story, and use the latest incarnation of the Hyper-Text Markup Language, HTML5. Before we dive into the specifics, I want to take a moment to explain the larger context in which we’ll be using HTML. When HTML was originally developed, it was designed to describe both what different elements of a web page were, and, what they should look like. Experience has taught us that this is a terrible idea, so we no longer use HTML in this dual role. Instead, HTML is now just half of a duo of languages used to create a web page – the other partner being Cascading Style Sheets, or CSS. We use HTML to describe what each part of the page is, and CSS to describe how each marked up element on the page should be styled. We’ll be moving on to CSS once we finish describing HTML. Until we get CSS, the web pages we create will look exceptional plain and frankly boring, but don’t worry, we’ll move on to CSS soon enough, and then you can really let your creative juices fly! Since we’re using HTML to markup text, the vast majority of a HTML document is plain text. We use so-called HTML tags to add context to that text. In general, tags come in matched pairs – an opening tag, and a closing tag. The content between matching opening and closing tags is said to be contained within the tag. An opening tag takes the form of the name of a tag between chevrons, and a closing tag takes the form of the name with a forward slash pre-fixed between chevrons. I prefer the to use <hr /> rather than <hr>, because it makes it obvious that the tag is void. I will be using that syntax throughout this series. Also note that the trailing / is illegal on non-void tags. Hence, you should never write something like <p />, because the p tag is not void. Be careful to always close regular tags, and never to close void tags, because if you make mistakes in your HTML markup, it will force browsers into to-called quirks mode. When when that happens, all bets are off – the results will be unpredictable and inconsistent, causing you nothing but headaches. Aim never to write quirky code! When we ignore archaic concepts like frames (which we will do in this series), all HTML documents have the same basic structure. 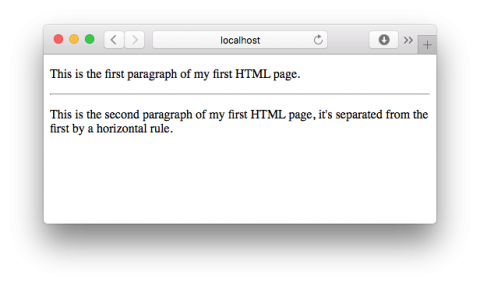 HTML pages should all start with a so-called doctype tag. This is a special tag that does not follow the normal rules, and tells the browser what version of HTML to interpret the remainder of the document as. If you omit the doctype, the browser has no choice but to guess, and like un-matched tags, that can result in inconsistent and unexpected behaviour. For your own sanity, always use a valid doctype at the start of your HTML documents! Note that a doctype tag is void, should never be written with the trailing /, and that the capitalisation must be as shown above. After the doctype declaration, the entire document is contained within a single html tag. The html tag should be opened directly after the doctype, and it should be closed on the last line of the document. 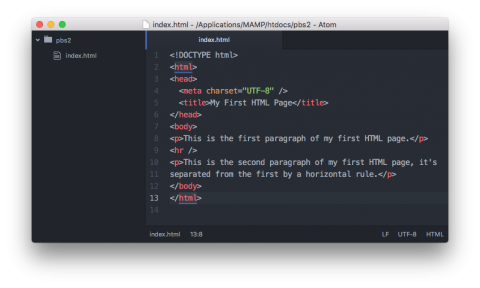 Within the html tag the document is broken into two sections, defined by two tags. The head tag comes first, and contains metadata about the document like the title browsers should display in the page’s window or tab title bar. This if followed by the body tag which contains all the page’s actual content. You should always use the UTF-8 character encoding for your web pages, and it’s good practice to explicitly tell browser that you are doing so by including an appropriate meta tag inside the head tag. Again, if you don’t specify a character encoding, the browser will have to make an educated guess, and it could guess incorrectly! The meta tag is void, so it should never be closed. You can think of comments as hidden notes that are for the benefit of developers, and are ignored by browsers. They are there for you to leave little helpful notes to your future self, explaining what your code does, and perhaps why you chose to do it one way rather than another. Comments can be spread over multiple lines, and can contain other HTML tags. Hence, comments can be used to temporarily make a part of a HTML document vanish from view. Let’s pull everything we have learned today together into a final example – a simple web page that contains two paragraphs separated by a horizontal rule. Using the skills we learned last time, create a folder called pbs2 in your web server’s document root, and using your favourite programming editor (I recommend Atom), create a new file called index.html in that folder. Once this file is saved, and assuming your web server is running, you should be able to view your newly created page at the URL http://localhost/pbs2/. “Experience has thought us that this is a terrible idea,” I believe you meant to say “Experience has taught us that this is a terrible idea,”. You may want to correct this in your posting. Thanks Jerry – fixed now!